In many ways, I’m very impressed by what Showtime has done with its in-depth series about climate change and the politics around it. Years of Living Dangerously is very straightforward and unapologetic, and it takes on the various types of folks who disbelieve in anthropogenic climate change without belittling them or their interests. I hope people are watched it, and I hope it is changing minds. 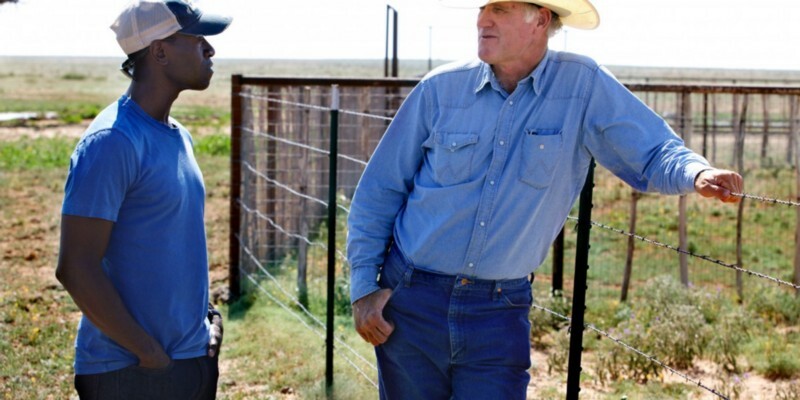 Don Cheadle talks with a Texas rancher about the impact of climate change on his business, but curiously not the impact of his business on climate change. So how is it that Showtime can highlight the plight of cattle ranchers and meatpacking workers affected by droughts, only to lament that their means of livelihood are at risk, never pointing out how dangerous their businesses are to themselves and the rest of us? The show also notes that deforestation is a major contributor to global warming but fails to explain the number one cause of tropical deforestation is cropland for livestock feed. These ironies are too elegant to not highlight at least in passing, yet they’re ignored in favor of presenting an innocently idyllic industry at risk due to sinister outside forces. America Ferrera speaks with an Indiana rancher about sustainable energy, but not about how raising animals for food contributes to global warming. This commentary is reprinted from my blog FuturEconomy. Please recommend below, and give me a follow on Twitter!